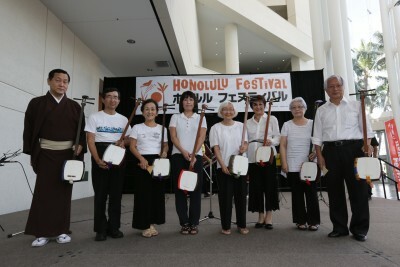 Hawaii Shibashukai performed Japanese traditional Shamisen with Ko’ula and Hauta songs for the last 10 years at the Honolulu Festival. 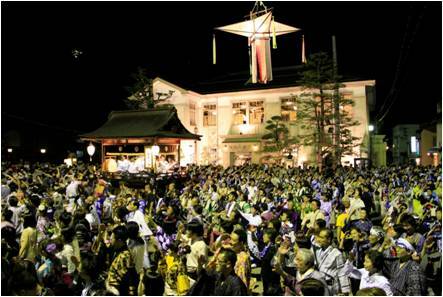 Performances will include Ise-Ondo, Gion-Ko’ula and Miyagawa-Ondo is with Japanese traditional dances. “Kanto” (Lanterns borne by a bamboo pole) Festival Pole festival was started as a folk event to protect people from sickness and evil. Neburi-Nagashi Festival was the event to pray for the rich harvest and the success for arts and crafts, and together with the Tanabata festival, which was held on the next day, respectively, July 7, these festivals were welcome the following Obon festival, held on July 15 (the lunar calendar). 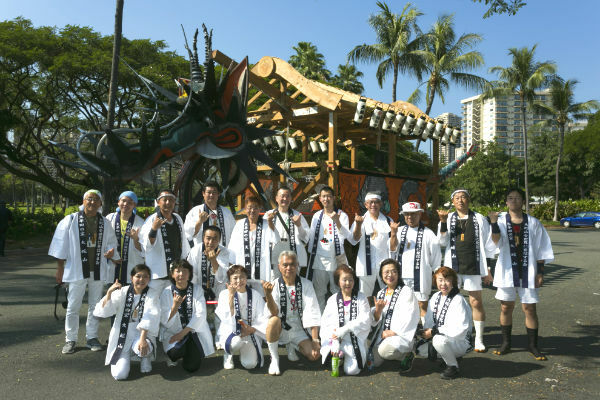 We are the group of Zomeki Shamisen (Japanese stringed instruments) for Awaodori, one of the three largest Bon Festivals in Japan. 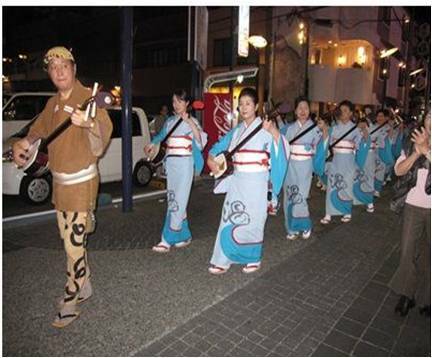 Our objective is to develop the performance skills and attract more people to play Shamisen. 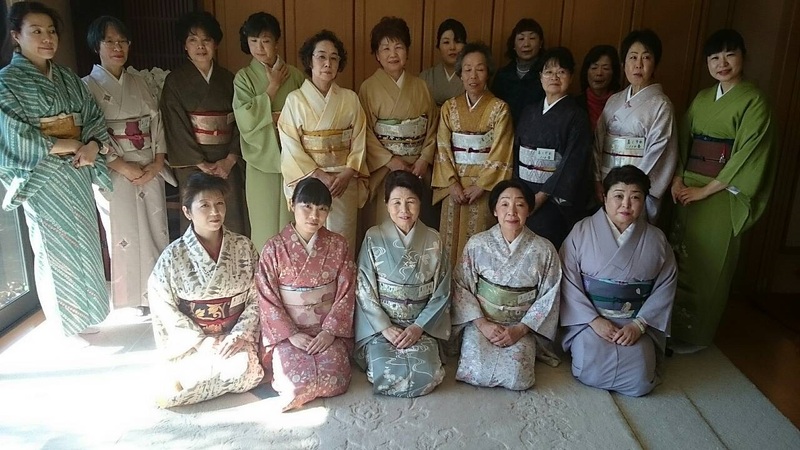 We are the Kimono dressing group. Kimono is a kind of Japanese traditional dress. We are planning to show to to tie Obi (belt) and dance Hanabi Ondo at the parade. Gujo Odori (An Important Intangible Cultural Asset) is a dance that has been passed on for over 400 years in Gujo Hachiman of Gifu prefecture. 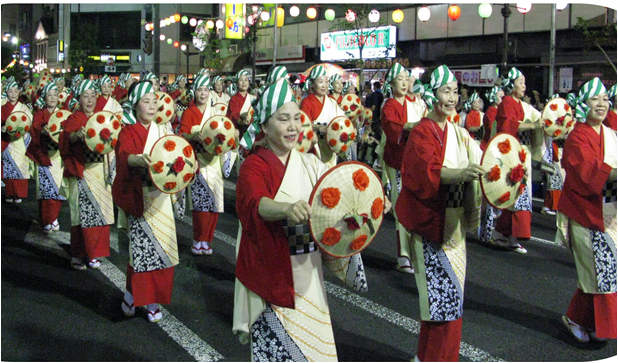 The most famous dance is called “Tetsuya (all night) Odori” that takes place in the Obon Festival (8/13-16). Tens of thousands of people dance together all night. 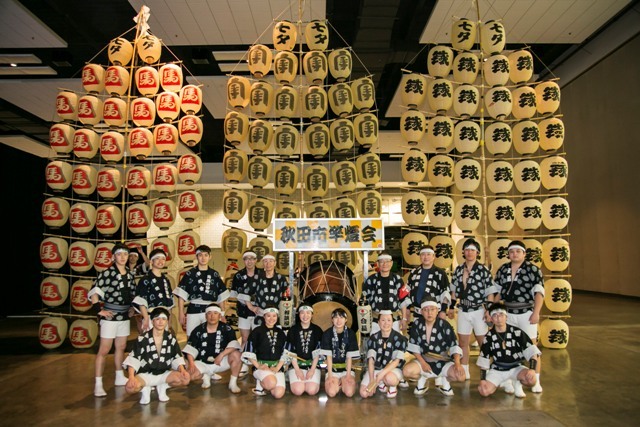 We are “Hanagasa Odori” dance group consisted of 100 people from Sakura area of Chiba Prefecture. Our objective is to join the “Yamagata Hanagasa Festival” every year. 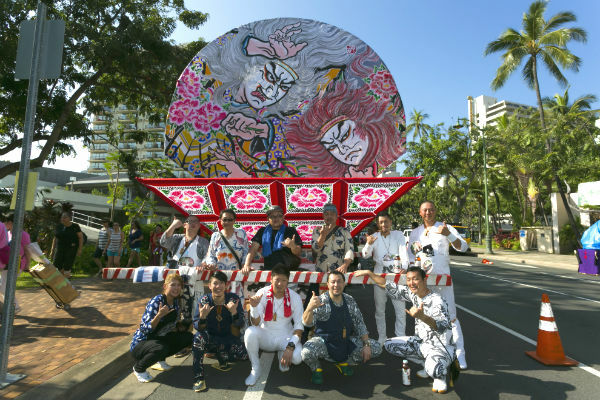 We will be performing “Hanagasa Odori” in the Honolulu Festival to celebrate and commemorate our 40th anniversary.